ATF is dedicated to combating violent firearms crime and working with Federal, State and local law enforcement in solving those crimes through the use of all forensic disciplines. A direct result of that commitment was the implementation of the National Firearms Examiner Academy (NFEA) in 1999. The NFEA is currently the only national training program to provide a standardized training curriculum for education in the forensic firearm field. 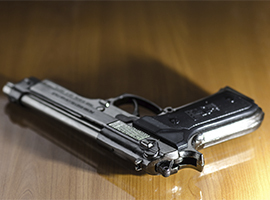 The year-long training program includes 18 modules of instruction developed specifically for entry level firearm and toolmark examiners from Federal, State and local law enforcement agencies. As a result of an additional need for training in specific forensic areas, two export modules of the NFEA are offered to firearm and toolmark examiners. These include Serial Number Restoration and Toolmark Examination, Comparison, and Identification. In order for law enforcement to adequately combat violent crimes, cooperation among Federal, State, and local agencies is essential to share knowledge and coordinate efforts. As part of this collaborative effort, ATF offers forensic firearm training for Federal, State and local law enforcement.